Your Local Reliable Electrician Leeds. Steve came highly recommended, he was punctual, tidy and very professional. Will be using him again when its required. We have used SS Electrical for years. They provide a top quality service at reasonable rates. They have completed a number of projects for us recently including a full re-wire. We would highly recommend them for your Commercial Electrical needs. Read What Our Customers Have To Say About Us !! Steve and the team were absolutely brilliant during a complete rewire of my house. They were friendly, had great suggestions about potential features, and their prices were very competitive. Their work was completed to a really high standard, and everything was exactly how we wanted it.I would recommend SS Electrical Leeds to everyone. Can definitely recommend. Have used a number of times and always reliable, on time, and do a quality job. Will certainly use again. A very helpful team of electricians. Honest. Fair. Quality work. Would definitely recomend, work done on time and to quote. High standard of finish. Great job. Great service for a good price. Done three jobs for me now all been on time flexible where needed and service with a smile. Definitely recommend. Great, speedy service. Extremely polite and personable. Very respectful of house. No fuss - nothing too much trouble. Recommend highly. Its refreshing to deal with a trades person that is as professional as Steve from SS Electrical. Great at keeping you informed, turning up on time, and getting the work done for a fair price. I'll certainly be using them again and would have no hesitation in recommending Steve. Good find - I'll be keeping his number! Steve recently fitted a new electric shower and pull switch for me and I would have no hesitation in recommending his work to any future customers. Everything was carried out in an efficient, professional manner with the minimum of fuss. Steve from SS Electrical was fantastic! I needed a job doing at very short notice and he was able to fit me in the next day (a saturday) and complete the job in a very professional manner, and explained all the work completed and needed without making me feel stupid. He was also cheaper than the other quotes I had got for this last minute job!I will definitely use SS Electrical again and recommend them for any jobs needed. 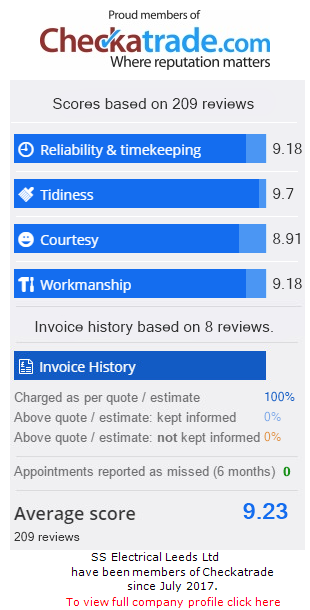 Great service at a competitive price. Steve and the team left the place clean and tidy and were always happy to help. Highly recommended! Steve and his colleague did a great job of fitting two new electric radiators for us. They also dismantled and disposed of our old (very heavy) storage heaters. They were on time, polite and friendly, fast workers and cleaned up the dust from the work afterwards. Plus, Steve always gets back to us quickly whenever we call/message! Totally professional, totally reliable. Steve knows his stuff and his team were excellent - punctual and honest. Highly recommended (sockets and light fittings). Now our go to guys for electrics. SS Electrical is your friendly and reliable Electrical contractors, based in Leeds and serving all surrounding areas. Our team of highly skilled and experienced electricians are capable of completing your work, closely following your specifications and completion dates. Regardless of whether you need us for a small commercial project or a long-term proposal, all of your work will be carried out to an incredibly high standard. Qualified, Registered and Recommended by many. All costs are clearly outlined to the customer before we begin work. We offer an extensive array of electrical services and we can supply, install, test and maintain all electrical appliances in full compliance of the latest electrical and safety regulations. Another range of services we offer, which is particularly popular amongst businesses throughout Leeds, is the installation of security features. This includes security lighting, Burglar Alarms and CCTV Cameras, which all offer a multitude of benefits to business owners, such as reduced insurance premiums and a decreased risk of being burgled. SS Electrical are also proud members of the Trustmark organisation. We hope this offers extra peace of mind when it comes to the quality of work that we provide to both Domestic and Commercial customers. Being a member of Trustmark also ensures that we operate to government endorsed standards. So, if you need an Electrical Contractor, SS Electrical LTD is the company for the job! For more information on any of our services, or to receive a free no obligation quote, give Steve a call on 07749 399665 or use our online Contact Form. You can also reach us via our Landline telephone number: 01132 718353.